On Sunday, February 5, 2017, we fulfilled our biggest longshot goal (by a mile) and landed on Easter Island. Everything about it was incredible, and we’ll break down everything it took to get us there, as well as try to describe what it was like during their annual Tapati Festival. 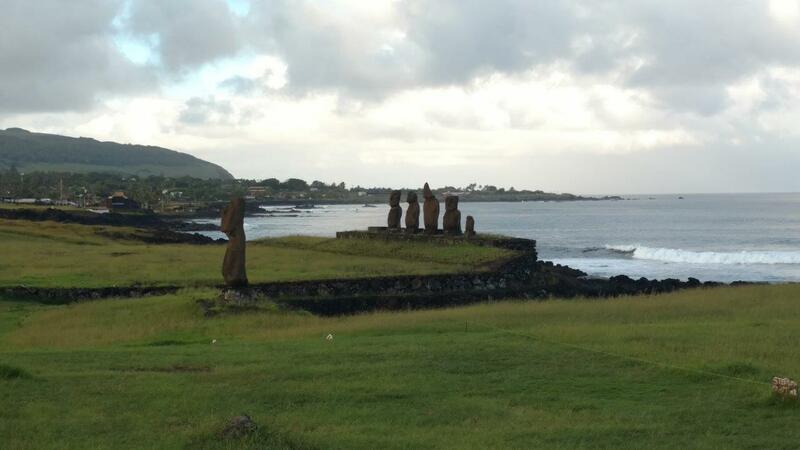 Where is Easter Island and Who Lives There? Hello, Chile! We’re so very far away from you and everyone else! 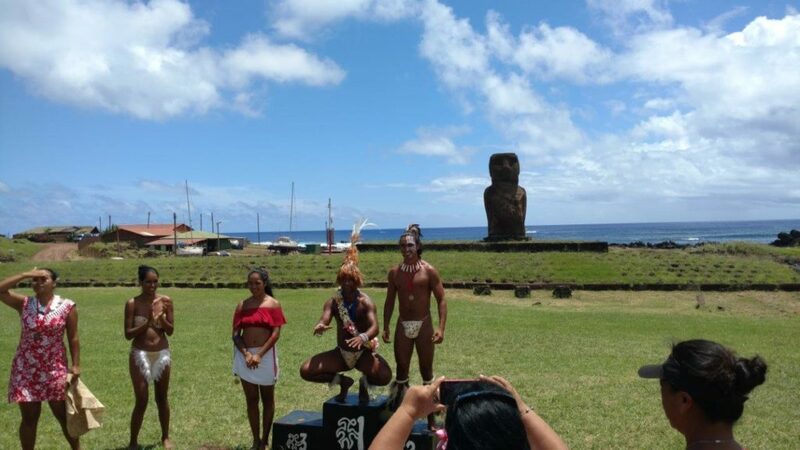 Until very recently, Chile was very “hands off” in their treatment of the island, which allowed the Rapa Nui people to maintain and preserve their culture substantially better than most other indigenous cultures. 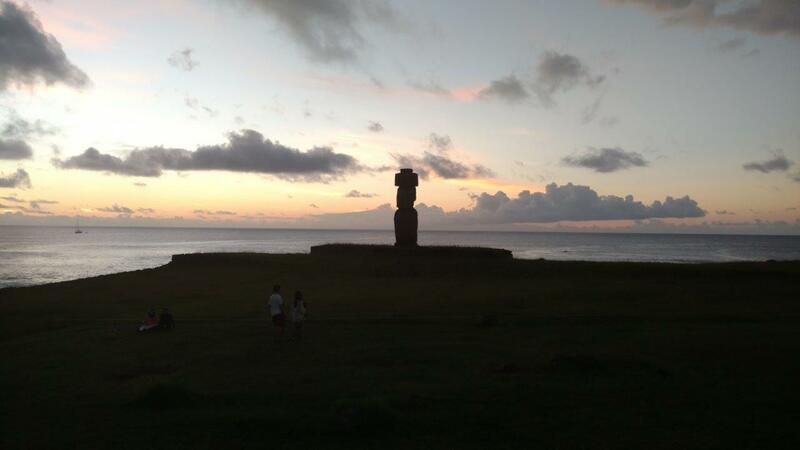 There is a Rapa Nui language, not spoken anywhere except on the island; in the Rapa Nui language, the island itself is also referred to as Rapa Nui! 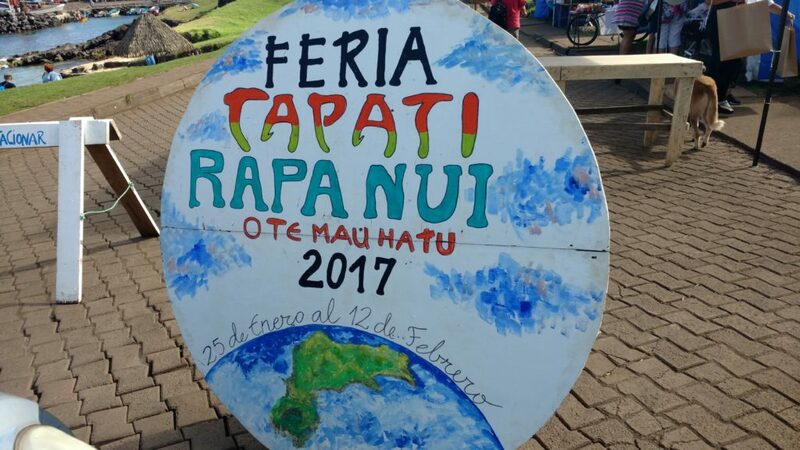 If the term “Rapa Nui” itself feels familiar, it was the name of a movie in the mid 90’s that’s (very) loosely based on some of the folklore and legends of the indigenous culture. From what we’ve read, the filming of the movie brought a huge number of Hollywood-types to the island, as well as all the money that normally accompanies them, and the islanders now have a high standard of living by most South Pacific standards. While most food has to be flown from Chile, this isn’t a place where visitors will have to skip their indoor plumbing, electricity, or internet access. There are, of course, some dissenters who long for independence, but (as we understand it), it’s a fairly small minority of people. Before I forget, I need to give a huge shout-out to this book by one James Grant-Peterkin. 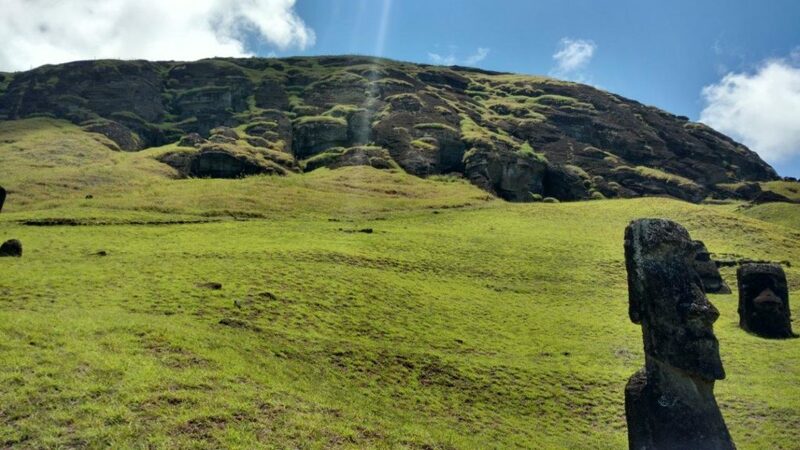 A British man who has since learned the Rapa Nui language and moved to the island, the author James is now the island’s sole diplomat and wrote an incredible guidebook for those visiting the island. Granted, it’s a small island, but it may be the best guide book we’ve ever used; it really felt like traveling with a personal guide, at a small fraction of the cost. You can read a fun BBC story about James here. 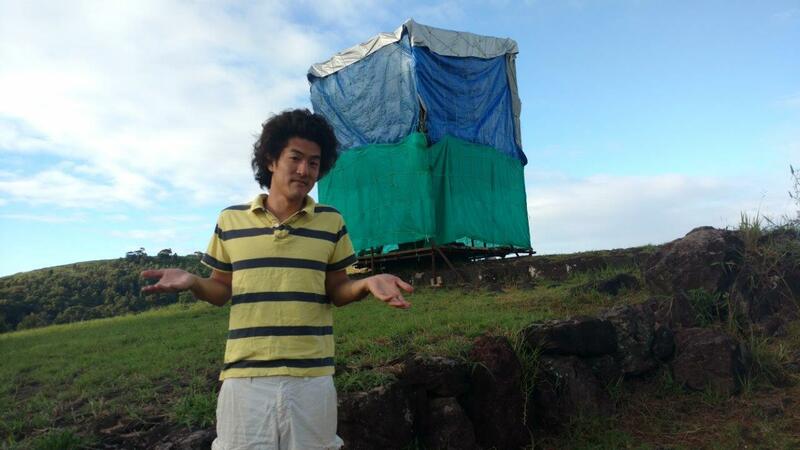 How Does One Get to Easter Island? 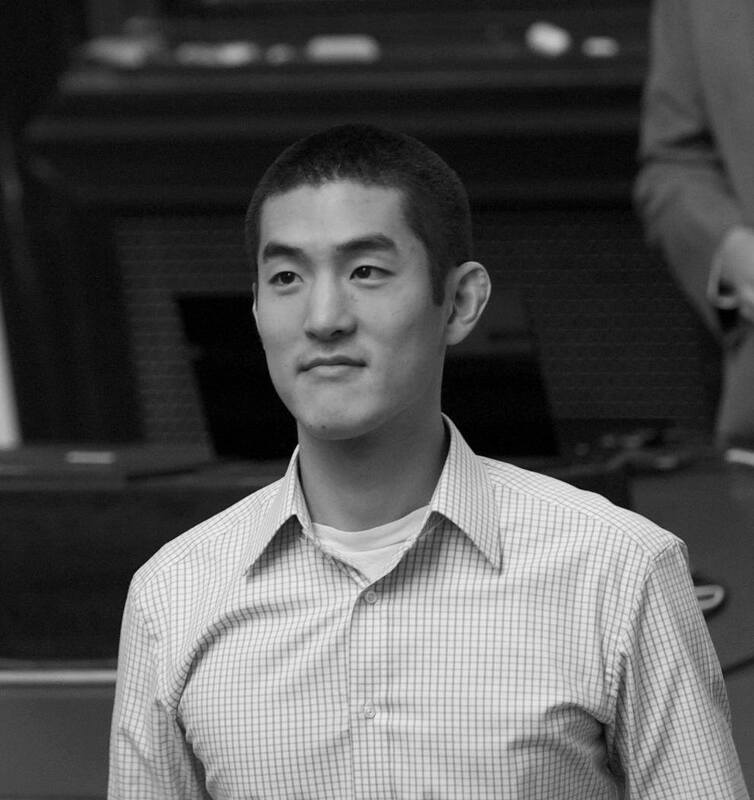 Can It Be Done Affordably? There are flights to Easter Island from Santiago, Chile, and only Santiago, Chile, requiring five hours of flying time for each direction. LATAM Airlines, formerly LAN Chile, is the only airline that flies there. 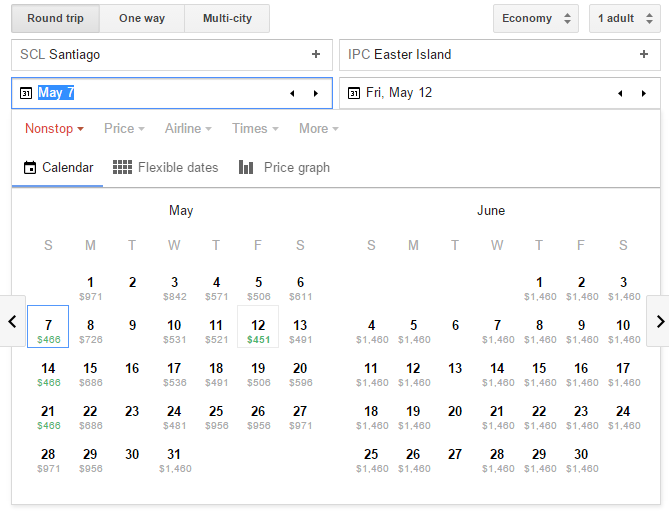 (Technically speaking, there is a flight to/from Tahiti once per week, as LATAM operates a flight between Santiago and Tahiti that uses Easter Island as a stopover.) 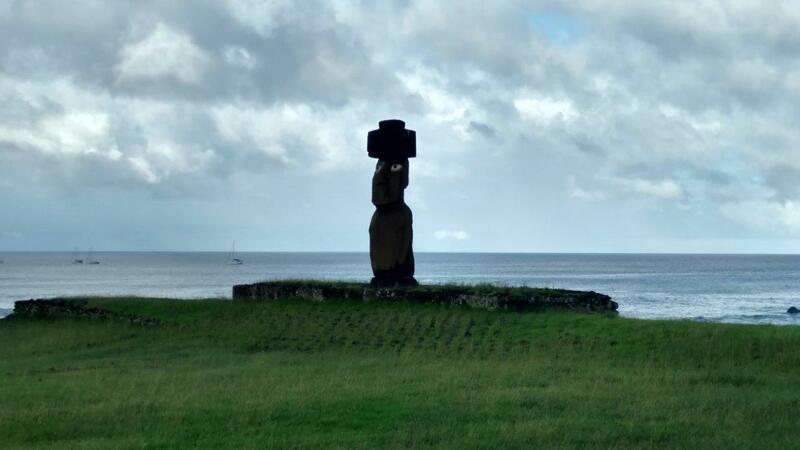 I’m not too fluent in airline politics, but I think that allowing another international airline to fly to Easter Island would require government approval by Chile, and I can’t imagine that they would want to break LATAM’s monopoly for any reason; the airline monopoly to the island is probably here to stay. It was, in fact, the last unsold seat available on the plane, hence the incredible price markdown. 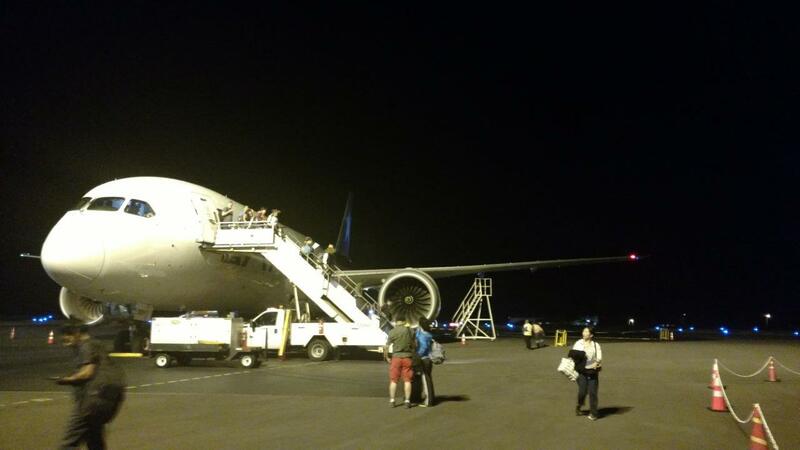 To be more accurate, though, it wasn’t the last seat on the plane; it was just the last seat in the Economy cabin. There was also one unsold seat in Business Class, being sold for under $500. Regular price for these tickets usually runs well over $2,500! When we changed our website language to English to make the purchase, the prices disappeared and were replaced with prices in the thousands of dollars! 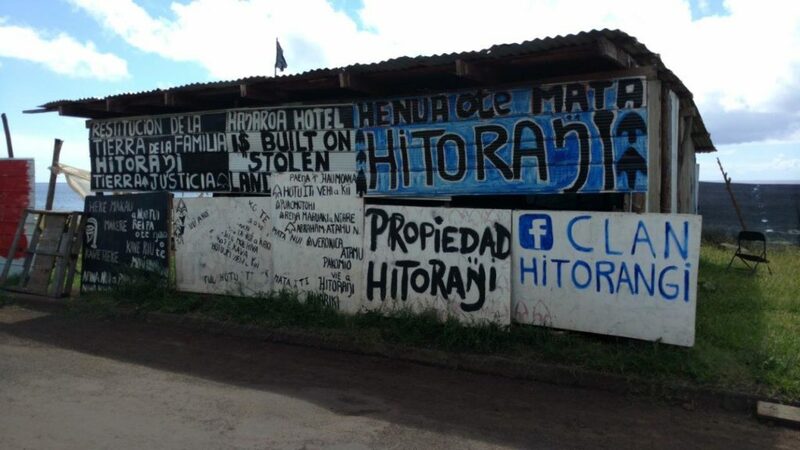 Only by operating on the Spanish language Chilean microsite could we get the prices we had seen! To this day, we also have no idea if having computer IP addresses in Chile was also necessary to find such great prices. 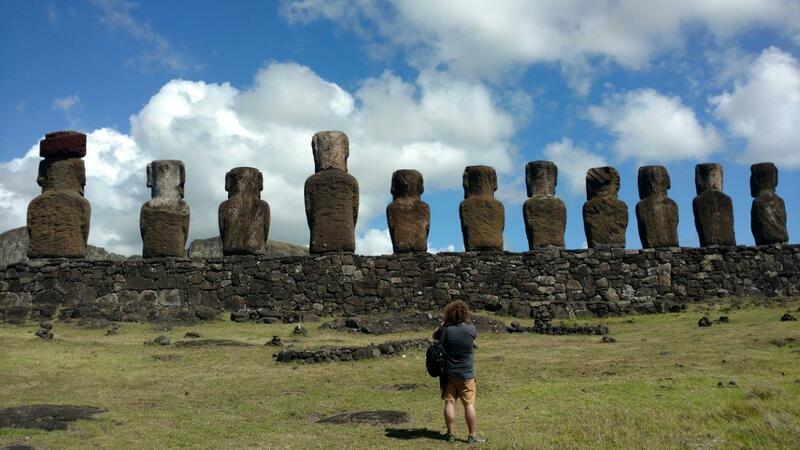 Three days later, we left mainland Chile for the island, excited about our once-in-a-lifetime chance to see Easter Island. 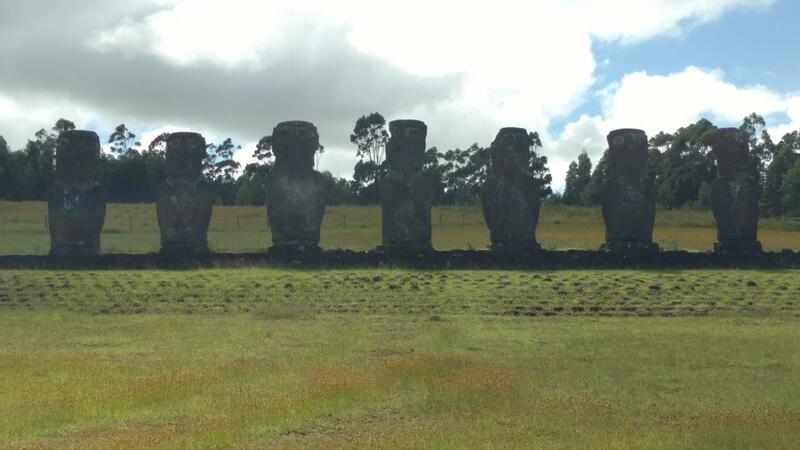 Easter Island is famous for most people as “the island with the big stone heads.” These Moai, as they’re known, were carved by the indigenous people hundreds of years ago and aren’t found anywhere else in the world, even on other remote islands of the South Pacific! 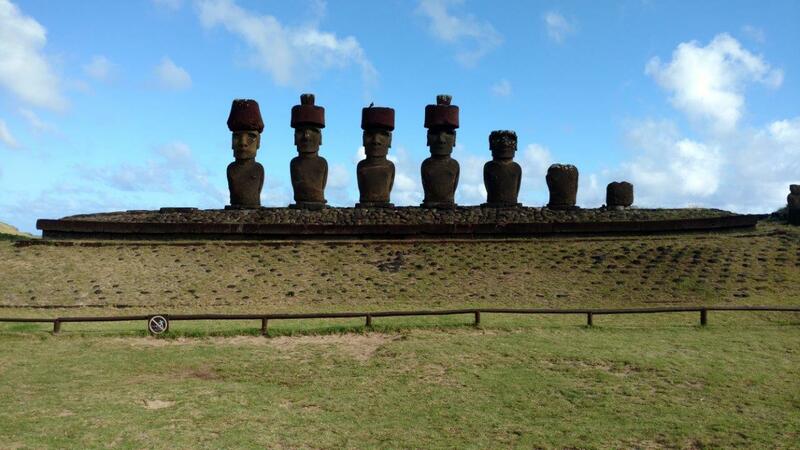 European explorers in the 1700’s reported seeing these statues standing upright around the island, but by 1825, a British ship reported seeing no statues left standing. 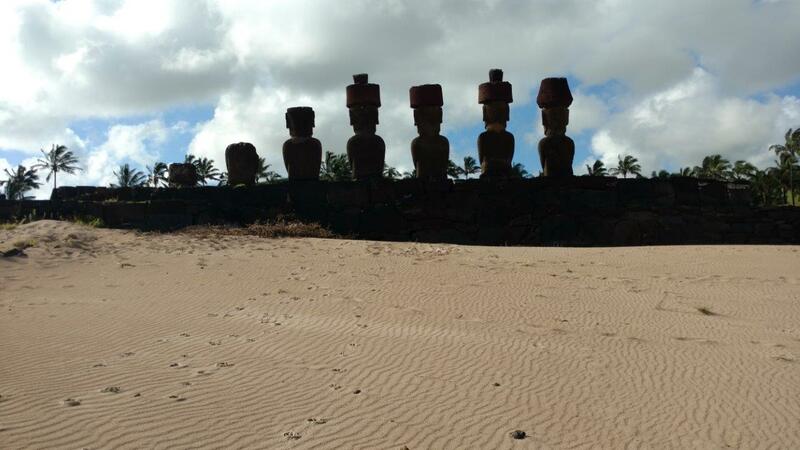 There are many theories you can read about why the statue-toppling took place, but no one knows for sure: the Rapa Nui people had no written language, and so no records exist to tell us. 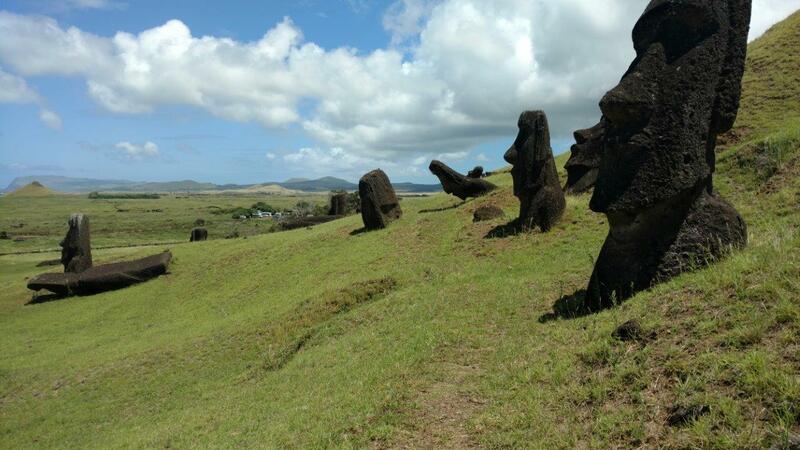 All of the carving took place at a single quarry on the island (“Rano Raraku”), where you can see the giant chunks cut from the mountain, as the statues were prepared before being moved to their final standing places. Some statues were also carved with “topknots,” which look like large hats. There’s a consensus among historians that they are more likely to be the hairstyle at the time, as chiefs of the various tribes on the island did not cut their hair, and instead wore it bundled up on their heads. 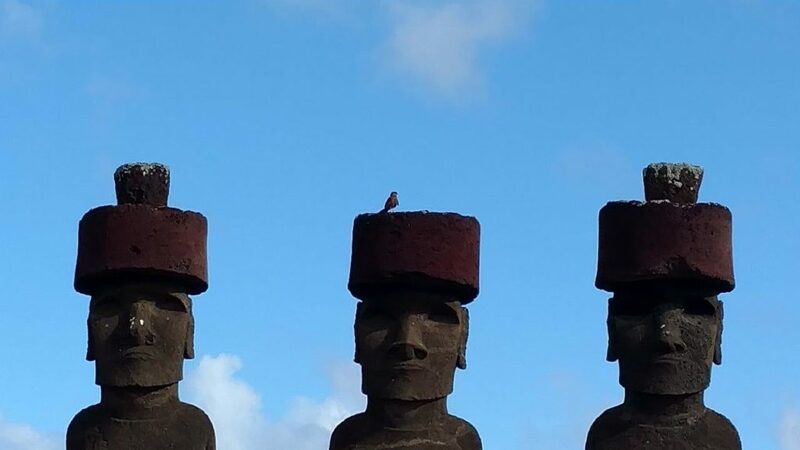 After being erected on a platform, Moai received eyes to activate their consciousness. You can see these steps in our various snapshots below. Little did we know until after we had booked our flights, we had timed our arrival to coincide with the annual Tapati festival. 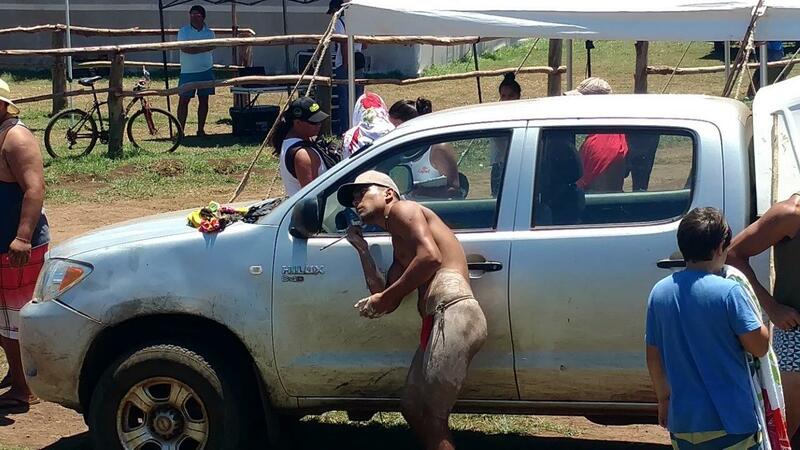 The festival is an annual celebration of the indigenous Rapa Nui culture, and for the past few years has become an incredible tourist high season. When we realized this, we were even more excited about the great steal we got on last-minute airfare; another tourist we met mentioned she had booked her flights months in advance and paid over $1,000 per person! The Tapati festival includes nightly performances with different themes. 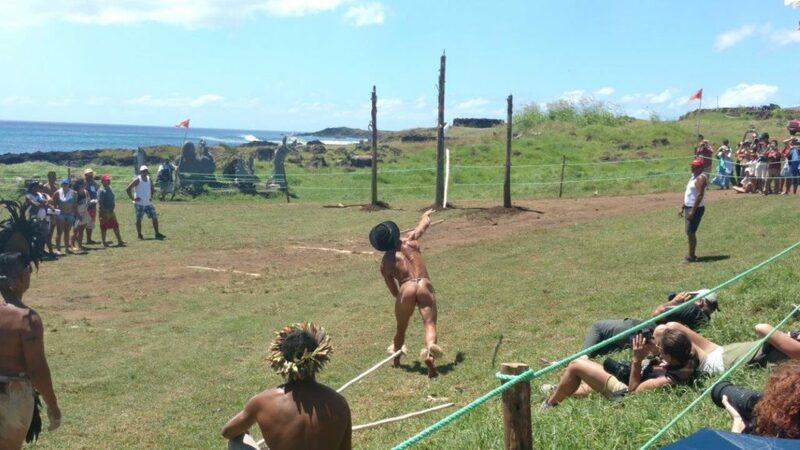 One night there may be a competition for theatrical shows to tell the history of the Rapa Nui people; another evening there may be a “musical” competition. 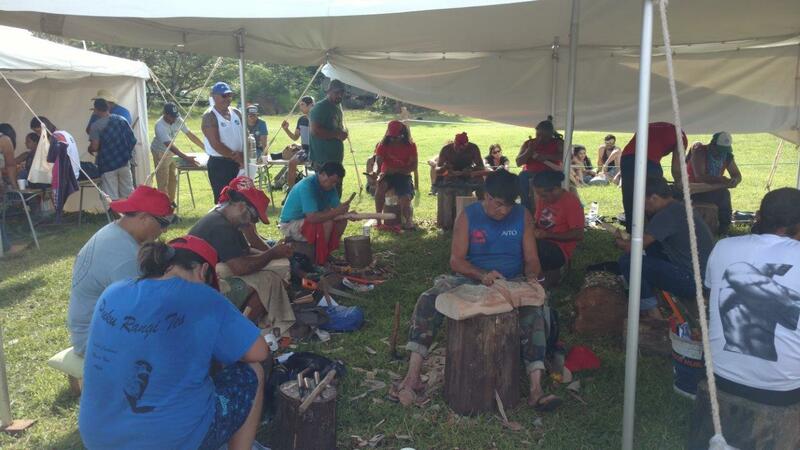 In addition, daytime includes competitions of athleticism and skill, with competitions such as javelin-throwing, swimming, or even wooden Moai carving. We managed to catch lots of these competitions and events in between our sightseeing. 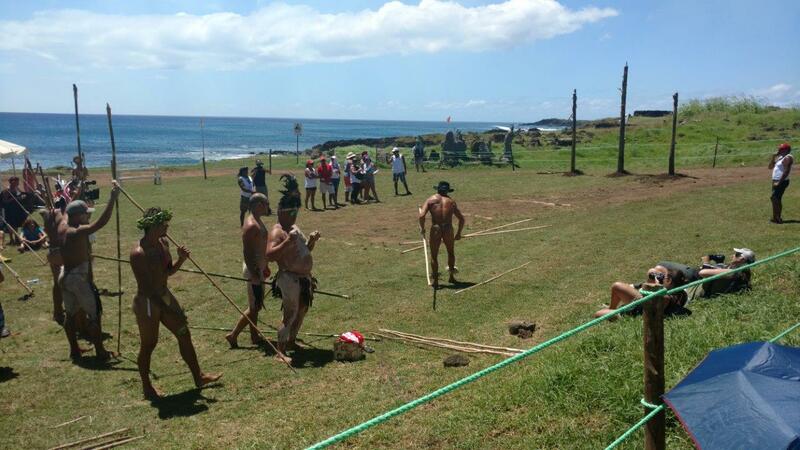 The most notable aspect for foreign spectators might be that many of the athletic contests are in traditional Rapa Nui garb: just loincloths! 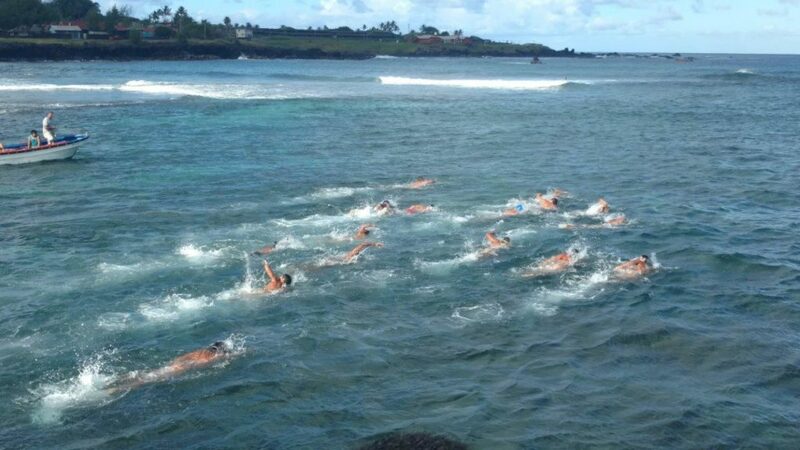 Swimming competition in open ocean – it was so far! The goal was to spear the wooden poles, and very few competitors could do it. I managed to capture this competitor’s second and third successes.